Promoting the advancement of Security, Loss Prevention, and Protection within the global supply chain and the professionals who work in it. The International Supply Chain Protection Organization (ISCPO) is a non-profit professional organization that connects members from across a wide array of sectors—from manufacturing, retail/wholesale/eCommerce, and distribution, to risk management/legal, law enforcement, and logistics. Our goal: to promote, educate, and advocate supply chain security and protection through building strong networks and delivering exceptional leadership training, board representation, and industry support. Together, we’re working to make the movement of goods and services more reliable, efficient, and transparent, so that companies working within these sectors can mitigate risk, control supply channels and costs, and maintain high industry standards. JUST IN: Introducing our Corporate Membership package, and a special offer! 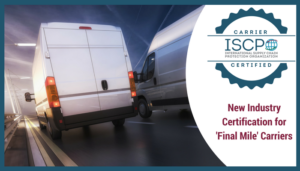 Carriers: Are You ISCPO Certified? Join the ISCPO today to gain access to networking opportunities, tools, training, and more. Your annual membership not only supports the ISCPO, it’s your direct connection to an ever-expanding network of like-minded professionals. Whether you choose a Corporate or Individual Membership you have the opportunity to shape the mandates and advance the needs of the industry, and your role in it. And, you'll get $50 off our Conference rate! Our robust membership facilitates extensive networking and the sharing of knowledge, trends, and ideas between private and public sectors. Take advantage of conferences and workshops, board meetings and other opportunities to connect one-on-one with Supply Chain professionals from around the world. Access our Membership Directory full of valuable connections. We provide the framework and executional capacity to advance the careers of professionals working in the Supply Chain business, including industry-specific training, certifications, and ongoing education and awareness activities. Get up to date trends, innovations, and industry news! Our members come from a host of leading organizations, including several Fortune 500 companies, and represent both the interests and the immediate and long-term needs of the industry on Boards and government panels for the betterment of the global supply chain network.